Previewed at: Event Cinemas, Bondi Junction, Sydney, on 5 June 2018. 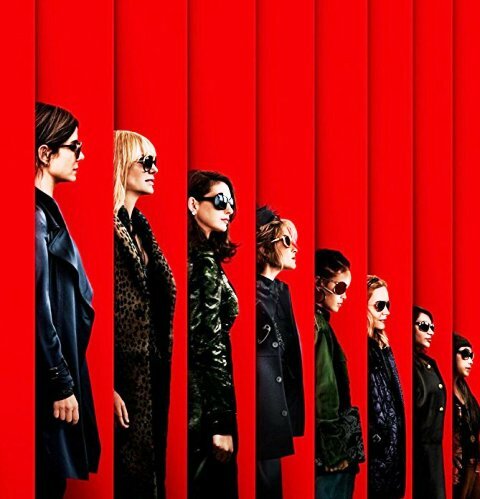 Ocean’s 8 is a spin-off of Steven Soderbergh’s Ocean’s trilogy and, although it’s hard to believe it’s been so long, it comes 11 years after the final film in that popular series, Ocean’s Thirteen. It’s been a highly successful franchise to date but this latest version switches the gender from macho to Madame and features an ensemble cast of some of the most recognised female actors in Hollywood, thus it’s timed perfectly to coincide with the current movement for female empowerment in Hollywood (and elsewhere). So the level of anticipation and expectation is huge and it’s guaranteed to do pretty well at the box office, but the questions have to be asked: does it pay off and will it be as successful as its testosterone-fuelled predecessors? The film opens with the release of Danny Ocean’s estranged sister Debbie (Sandra Bullock) from a five-year term in prison. Not to be daunted by her years of boredom, Debbie has put her confinement to good use and planned the heist to end all heists - the theft of a Cartier necklace worth millions - and where will this take place? The Met Gala, no less, the most glamorous, sought-after social event in New York City. For this she will need a team of criminals who are experts in their trades but first she has to hook up with her gal-pal (and girlfriend?) Lou (Cate Blanchett). The two women set out to engage the team, which ultimately consists of Nine Ball (Rihanna), a weed-smoking hacker, Amita (Mindy Kaling), a skilled jeweller, Constance (Awkwafina), a brilliant pick-pocket, Tammy (Sarah Paulson), who’s worked with Debbie before, and Rose (Helena Bonham Carter), an eccentric fashion designer. To pull off the plan they have to somehow get Daphne Kluger (Anne Hathaway), a celebrity attending the Gala, to first engage Rose’s dress designing talents and then convince Cartier that their necklace, that is locked in an underground vault and hasn’t been seen in public for years, just has to be exhibited on one of the most beautiful necks in the world! Not much to ask then. The cast appear to be having a ball (boom boom!) and bounce off one another. Blanchett is terrific as the gum-chewing, laconic Lou, riffing her way through every scene. Bullock is strong, too, but somehow something is lacking in her character - are we supposed to think she’s grieving over the death of Danny? Helen Bonham Carter is as ditzy as usual (typecast?) and looks like a demented version of Vivienne Westwood. Credit must go to Rihanna who proves she can act as well as she sings and, in what is definitely a case of art imitating life, makes the best entrance to the Gala in a figure hugging gown. She sizzles! To add to the fun and real-life references, there are plenty of cameo appearances from the likes of Anna Wintour, a few Kardashian/Jenners, Katie Holmes, Serena Williams, Hailey Baldwin and more. While not entirely successful, Ocean’s 8 is enjoyable enough and you can spend a bit of time playing ‘spot the celeb’ at the ball. Although the script rockets along, it lacks tension and is all a bit too glib, shiny and superficial. Still, it’s probably the closest many of us will get to being part of Met Gala (unless you watch The First Monday in May) and for this reason alone, the viewing is a fun, if somewhat detached, experience.